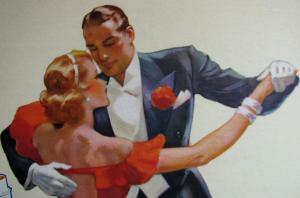 The essential thing to remember is that the Waltz step is not defined by direction, it is defined by rhythm. Certain feet always move on certain beats, but they might step forward, to the side, backward, across or perhaps just mark time in place. 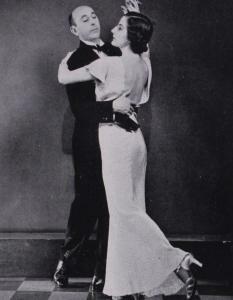 Of all the many ways to Waltz, this back-and-forth box step is the best option for a crowded floor, as so many floors were in the Jazz Age. Rotation was a major element in Waltzing, though not to the extent it had been in the 19th Century or it was with the Viennese style. The "Natural" turn is the most comfortable and, well, natural. If you take a long step forward with your left on the first beat of the first measure (ONE-two-three) and then step back with your right on the first beat of the second measure (FOUR-five-six), but rather than step straight back, move your right foot diagonally behind your left foot - then you will rotate clockwise in a "Natural" turn. You can do this slowly and easily, which is greatly recommended for beginners, or if you and your partner are comfortable and confident, you can speed it up and actually cover some ground and have a sense of continuous rotation. As it speeds up it can become essentially the partners doing a sequence of: 1-2-3 the Leader, with a long first step passes in front of his partner while his partner pivots in place - followed on 4-5-6 by the Follower taking the long left foot stride while the Leader pivots. The pivot can be an actual pivot with the dancer simply rotating in place, but is more often a series of small steps, marking time in place while turning. The "Reverse" turn is a little less intuitive, and may take some more practice. The key to this turn is the left foot. Instead of stepping forward on the first beat, it steps back, behind the right. Then the right moves forward slightly, carefully avoiding stepping on the partner's toes. Reverse turns are a nice variation if you can manage them smoothly, but not essential. On a personal note: using the old dancers' trick of "spotting" (focusing on a distant point so your head is stable while your body turns - and then popping around to focus on another distant point) I can avoid dizziness through an infinite number of natural turns. However, I get dizzy very quickly when doing reverse turns. That's probably just me, but there it is. But if all that ONE-two-three stuff is just not working for you, in the Jazz Age there is no dance to which you can't just walk. "The Canter Waltz has been revived and presents an opportunity to show the use of "direction" in the straight backward and forward series of walking steps. This dance is walking to waltz time but walking most quietly and gracefully. There are two steps to the three counts of music. Step forward on x and make the second step between the 2 and 3 count. Give the first step the accent, although the steps are almost of the same value. It may, perhaps, help the student practicing alone with the aid of the victrola to count 1-&, 2-&, 3-&, making the second step on the second &, until able to do the step smoothly." In teaching this step, I tell people to step on the strong first beat of the Waltz phrase, then, without changing weight bring their trailing foot up on beat 2-3 and do a slight rise, then on the next down beat, step out with the trailing foot and repeat. It really is just Step-on-the-downbeat, with the other foot wasting time until its turn to step. This step is generally danced in a linear fashion, backing the lady and then perhaps, out of a sense of fairness, pivoting so that the man is backing. It could also be danced in a lazy box-step or you could throw in some of your favorite Foxtrot variations to liven it up a bit. Even if you are an experienced dancer, and master of the most demanding forms of Waltz, I highly recommend you add the walking Waltz to your tool-box in case you find yourself dancing with someone who has never learned to Waltz. You can teach this step to anyone with a rudimentary sense of rhythm in about thirty seconds, which means that rather than three and a half awkward minutes of stress and frustration, you will enjoy a congenial though simple dance, and put off intensive instruction to a more appropriate time. 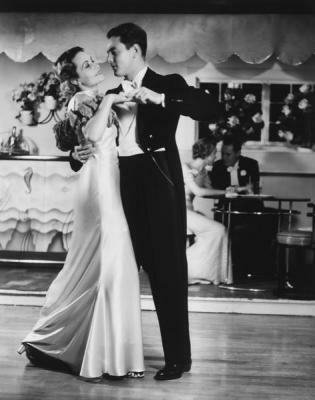 The step-on-the-downbeat style isn't just for those who can't quite master the regular Waltz step. It is also deuced handy when trying to dance to an ultra-fast Musette Waltz such as the Parisians tend to favor. I could try to describe the Jazz Age Waltz in greater detail but fortunately I don't have to. Here is a pastiche of 1920s and '30s Waltz footage: instructional films, ballroom competitors, movies and a newsreel of a London nightclub.